JiggaWatts is a fantasy betting game where the user wagers on their expected energy consumption on a daily or weekly basis. If their actual usage falls within their bet’s range, they win. If it does not, they lose. The concept is simple, but the impact this app can have is real. JiggaWatts was designed to raise awareness and promote reduction in energy consumption. It does this in a non-conventional way by weaving these themes subtly into the betting system and empowering the user to come to their own conclusions on what needs to be done to win. JiggaWatts does not attempt to sway one’s decisions through complicated usage graphs displaying negligible dollar savings. It does not attempt to shame someone if their usage is considered high. It does not even try to explain what a ‘kilowatt hour’ is. Instead, JiggaWatts implements its awareness and conservation goals via its slogan: BET. WIN. BRAG. 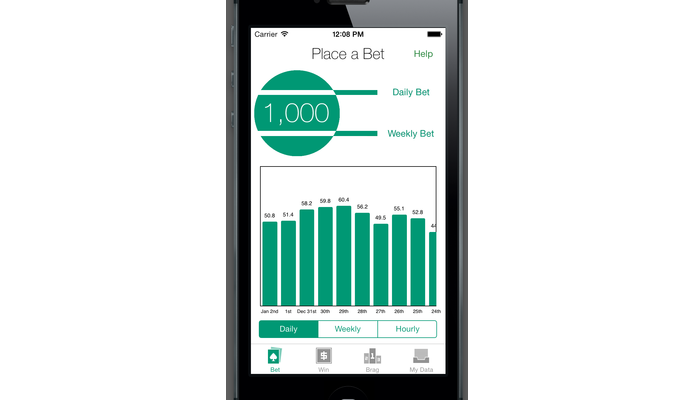 JiggaWatts allows the user to place bets on their future usage levels. Measures taken to win could include turning off lights or hunting for vampire power draws, for example. As the user makes bets and learns about their energy usage patterns, the accuracy of those bets will improve, and they will have a growing game balance to show for it. This balance could be the user’s end goal, but it is not the app’s true purpose. The real goal is to transform them into an expert on their own energy consumption – a great first step in the education process towards becoming a greener consumer, and it was accomplished without framing the conversation about education around graphs or difficult to understand metrics. Winning provides an adrenaline rush – a reward for following through on the commitments made in the ‘BET’ stage. This sets up a positive reinforcement cycle that promotes energy education and makes the user want to place their next bet in a tighter range for a larger payoff. To play on a famous quote: If a bet is won and no one is around to hear it, does the winner make a sound? What good is winning if no one knows about it? JiggaWatts encourages the user to bring their social network into the game. They can brag about their bets when they place them, or brag about the size of their wins. JiggaWatts supports Twitter, Facebook, email, text messages and Apple’s iMessage. The app contains leaderboards that track the all-time largest balances, or biggest bets, and the user can track their rank against their friends, or even across the world. Leaderboards distill all their actions in the game into a rank, and they can strive to be number one. JiggaWatts also implements an achievement system to reward players inside the app for their actions. The achievement system is designed to keep the less social players as engaged as the social media savvy. Achievements include placing bets of certain sizes, winning bets of certain sizes and rewarding lowered energy usage, to name but a few. Users can also issue challenges via Apple’s GameCenter to specific friends and have them try and top their own best bets. By engaging and encouraging others, users start others thinking about their own energy consumption. Large province-wide shifts in usage patterns can occur through many people taking small steps towards a common goal. JiggaWatts is an Apple iPhone/iPad application built for iOS 7, created using a minimalistic design approach which champions the use of whitespace and minimal graphics. During development iterations, we looked to see how the layout could be streamlined. This resulted in JiggaWatts only using three colours in the entire app: white, black and Pantone’s 2013 colour of the year: emerald green. This results in an app where the user’s usage data, and the game itself, take centre stage over smoke-and-mirror presentation tricks. 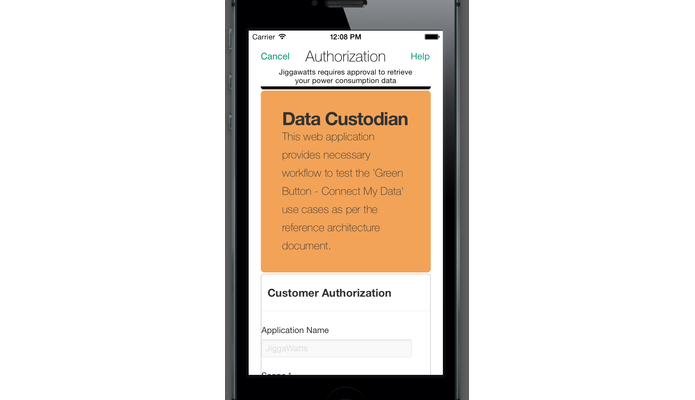 JiggaWatts stays true to mobile platform and its paradigms. A mobile game is generally only used for a few minutes at a time when you are idle or bored. JiggaWatts provides that few minutes of entertainment while passively educating the user on energy conservation. Bets resolve daily or weekly, so they always have a reason to come back and see how they did. JiggaWatts raises awareness while pushing the user towards conservation with an invisible hand. The conservation agenda is only apparent when they look at the rules surrounding bets, and the constraints placed on them. 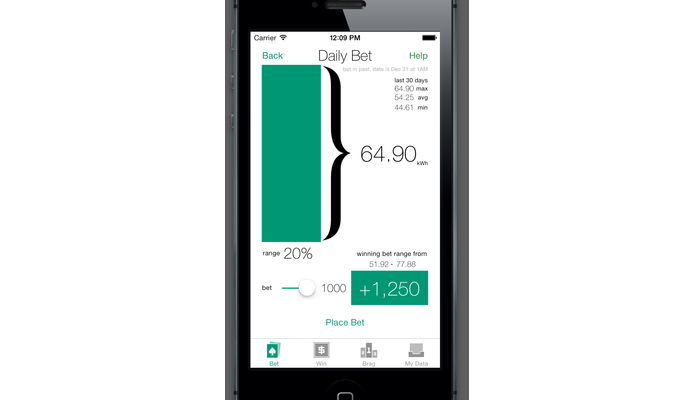 When placing bets, the maximum allowable bet usage is their maximum usage over the past 30 days. Also, bets with ranges greater than 10% don’t pay off that much. The larger payouts begin in the much more difficult 5% or lower range. These rules have two effects on a user’s energy consumption: The first is that they are forced to place a bet that will lower their overall average actual usage. The second is that they are forced to place bets that require active management of their consumption in order to win. Bonuses are only awarded if the user’s original bet was a winner. They need to be aware of their current usage, and if they would like to win a large bet, reduce their usage in order to collect the large bonuses. 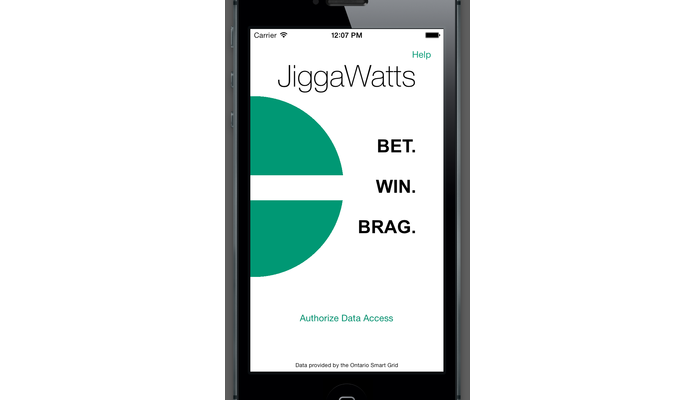 In conclusion, JiggaWatts is a fantasy betting game for iOS7 where the user wagers on their expected energy consumption on either a daily or weekly basis. The rules that were implemented around this betting system promote its green goals: to raise the user’s awareness regarding their energy usage; to passively persuade them into reduced consumption; and to engage their friends to spread the word, so they accomplish the same savings, sparking a viral wave of energy awareness and conservation that results in large scale changes. Sorry, due to the lack of adoption of the Green Button “Connect My Data” standard, Jiggawatts is not available for download.